PortaBucker by Skinny Piranha - ON SALE! - FREE Shipping! Remove 100 pounds of DRY or Wet Flowers from stems or vines in 8 hours! The average bucking time per pound is four – six minutes! Faster bucking means less processing cost. More importantly, the Skinny Piranha Portabucker™ cuts flowers from stems reducing bud destruction caused by competitive Bucking machines. PortaBucker™ is Easy to use, adapts to your specific product requirements, is light weight, portable, and costs less than other older style buckers. PortaBucker™ is the ultimate light commercial bucking machine for cannabis, hops, and specialty herbs. Don’t let size fool you. This is a high performance, high volume bucking solution that sports variable speeds needed to adjust speed and power processing for different crops and various moisture contents. Are there super secret hidden Skinny Piranha Technological features? Of course! At the heart of variable speed performance is a high torque low voltage motor that runs quiet with minimal power demands. Thus you reduce your carbon footprint and help to keep our planet GREEN! We combine all that with portability, durability, and ease of use. A foot switch makes on/off and power boost operations possible while you are using both hands to feed stems to the bucker. Bottom line: the machine is fast yet more gentle on your crops and on itself. And compared to current market price points for bucking machines from our competitors, you could easily own three or four PortaBucker™ machines for the price of one of the competitors’! That would provide four times to processing throughput. PortaBucker™ swims circles around competitors’ price/performance. Before purchasing your next bucking solution compare our PortaBucker™ features, performance, testimonials, and value. (1) Actual bucking time depends on flower size, dryness, density, strain, and stem preparation. (2) Model TB5.1 is configured with rear mounted touch panel controls / Model TB5.2 is configured with side mounted rotary dial controls. The Skinny Piranha PortaBucker ™ is a light commercial wet or dry “Bucker” used for stripping Flowers from Cannabis, Hops, and herbs grown for essential oils. PortaBucker ™ works by pulling a plant stem through a hole in a stripping plate. The stripping plate hole has raised cutters that cut through lateral stems. Desired plant materials such as flowers build up on the front face of the stripping plate while the unwanted stem(s) pass through the plate and are ejected from the rear of the bucker. PortaBucker ™ hast three main parts. Base – contains the drive motor, drive wheels, and chain drive system. Foot switch – provides a way to turn the drive on and off to free both hands during general operation. 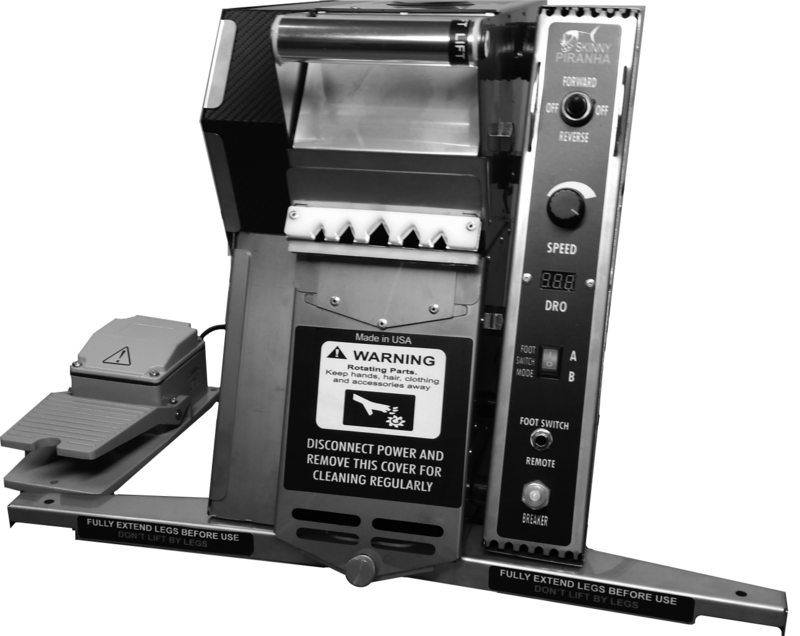 PortaBucker ™ operates on 110VAC or 220VAC. Check that the voltage switch on the Power Control Unit is properly set before operation. Failure to set this will result in damage to the equipment and possible injury. Connect PortaBucker ™ to a properly grounded AC outlet. PortaBucker ™ requires 2.5Amps minimum at 110VAC or 1.5Amps minimum at 220VAC single phase 50-60Hz. Disconnect AC power before any cleaning. Ensure that the Power Control Unit is securely and completely engaged in the red mounting rings before use. Ensure that the cable connector between the Power Control unit and the base unit is fully inserted, turned, and locked before connection to AC power. Do not use the cable connector between the Power Control unit and the base unit as a handle. Read all use instructions below before use. The PortaBucker ™ is designed to sit on a 27 gallon plastic tote such as those available from Home Depot. Support Trusses (C) should be fully extended to rest on the long sides of the tote and the recess in the rear of the case should sit in the center of the short side of the tote. Ensure that the PortaBucker ™ is secure on the tote before connecting to AC power. If using the PortaBucker ™ on a flat surface (such as table top) instead of riding on a 27 gallon tote, it is recommended to have a non-skid surface . During use, the PortaBucker ™ can be pulled abruptly when stems are being fed into the stripping plate holes. It is also recommended to fully extend (C) for stability wehn used on tables or bench tops. Wear protective eye and hand protection and avoid loose clothing with operating the PortaBucker ™ to avoid injury. Material can reflect off the stripping plate and strike the equipment operator. Proper speed setting can minimize this behavior. PortaBucker ™ is made from sheet metal that may cut skin when being moved, wear gloves during setup, cleaning, maintenance, etc. Use the front and back handles provided when moving the PortaBucker ™ at any time. 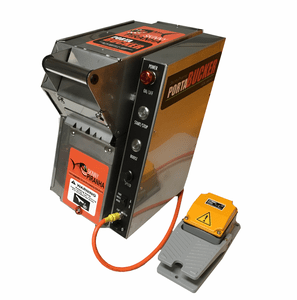 PortaBucker ™ pulls plant stems into a cutting and stripping plate (A) that can also cause injuries of hands, gloves or loose clothing is pulled to the cutting surfaces. Do not feed stems shorter than 9″ into the PortaBucker ™. Never start the PortaBucker ™ drive in forward or reverse when the stripping plate (A) is not installed and securely tightened in place. Do not place anything into the ejection shoot when the drive is running. Never submerge or spray cleaners into the Power Control Unit. PortaBucker ™ electronics and motor operation are protected from electrical failure including overload and short circuit (to the motors). A 7.7 amp ATO (#7) customer replaceable fuse is located on the bottom front of the Power Control Unit. Only replace this fuse with one of equal amp rating. If replacement fuse fails, call customer service for instructions or repairs. 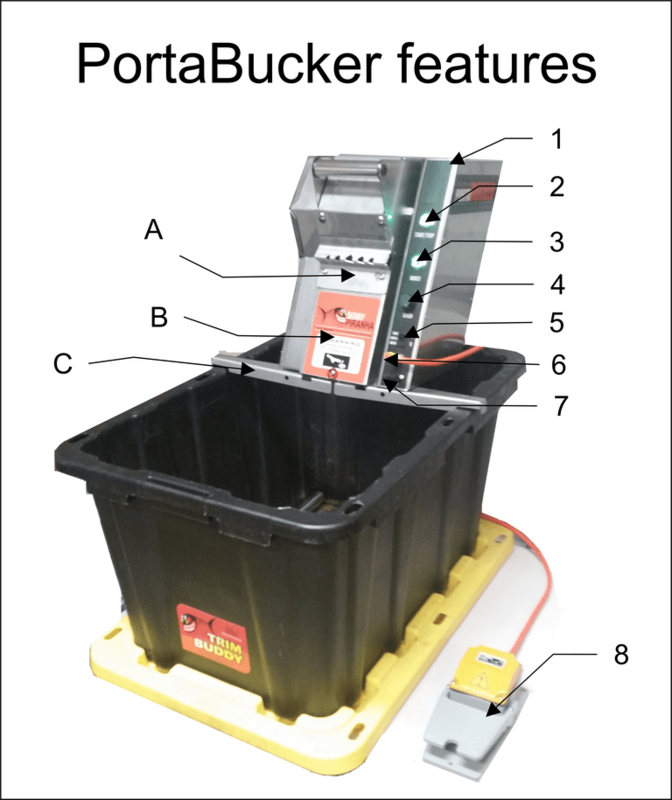 PortaBucker ™ can be operated with a foot switch(#8). The foot switch can either start and stop the drive motor or provide a small boost of power to the drive motor. Which function depends on the position of the mode switch (#5) on the control panel. When using the foot switch, ensure the switch is on a non-skid surface and that it is not located as a trip hazard. The foot switch operates on very low power and voltage. Be careful not to subject the foot switch to high static discharges. PortaBucker™ powers both drive wheels with a roller chain system. If the drive is not functioning but a motor sound is heard call customer support. Attempting repairs of the chain drive system will void the product warranty. Cut plant stems to be bucked in 12″-36″ lengths. Start with a few test pieces and adjust the speed (#4) to achieve the best final product result. After starting the drive, wait two seconds for the drive wheels to reach set speed then feed stems one at a time into a strip plate with open just larger than the current stem size. Clear any plant material from the strip plate and repeat. If stems must be forced into stripping plate, then separate lateral branches and feed separately. When bucking dried flowers, best results are achieved when stems are somewhat flexible and not brittle. Determine what speed produces the best flower quality for your strain and level of product dryness. PortaBucker™ comes with two strip plates. Cutter holes in the strip plates have different shapes designed for different cutting characteristics. Try each plate to determine which plate performs best for your product dryness and variety. Note: It is recommended as minimum clean up to remove stripper plate(A) and lower sheet metal cover (B) and remove plant debris from accessible steel and rubber surfaces.